I am trying to troubleshoot a recent problem with volume on my music. I analyzed my library long ago with beaTunes for repaly gain. "Embed non-itunes fields is on" and all my devices have sound check on. There is no volume adjustment in the itunes "options" tab for each of my files, although each has a replay gain setting in beaTunes. 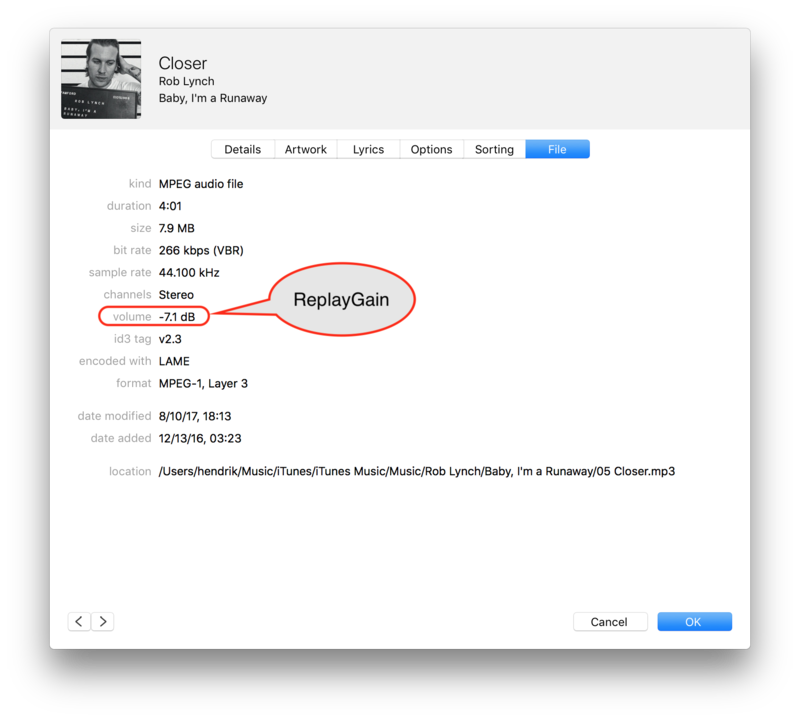 Should the replay gain settings be stored in the volume adjustment on the options tab in iTunes or elsewhere? And if there is something wrong what should be my next step? I am running Mac Sierra (10.12.6) and the latest versions of both iTunes and beaTunes. I analyzed my library long ago with beaTunes for repaly gain. "Embed non-itunes fields is on"
Was it on before you started the ReplayGain analysis? There is no volume adjustment in the itunes "options" tab for each of my files, although each has a replay gain setting in beaTunes. iTunes does not show ReplayGain under "Options". It's shown under "File" (see attached screenshot).